Have you ever tried to count how much food you throw away every month? Most people say they never waste products. However, once you think about it, you’re surely going to remember the days when you bought two packs of cereals when you needed one, or grabbed three loaves of bread when you only needed two. What happened later? Bread went stale and the cereals got infected with those tiny bugs you saw floating in the milk over your cornflakes one gloomy morning. Can you remember better now? Now imagine that every day some of the food we buy is thrown away. Milk goes sour, veggies get wilted, fruit gets rotten, and all of it goes straight into the dumpster. Recent surveys show that Americans throw away nearly half as much food as the country produces. And it’s happening in the world where thousands suffer from malnutrition and in a country with over 40 million people living in poverty – that is, in food insecure households. Apart from the moral side of the issue, buying more than you consume hurts your budget. When we see three things sold for the price of two, we want to take them right away, thinking that we’re saving money. When in fact we realize we only needed one and two others get spoiled and thrown away, it dawns on us we’ve spent more money than we thought we saved. Is there a way to break the cycle of food waste? And is there a way to save money when shopping instead of spending too much? Luckily, the answer is yes. One of them is using the Martha & Marley Spoon food delivery service! Some might say it sounds ridiculous. In what way can a meal delivery service – even the best meal delivery service help saving money? However, that’s what Martha Stewart said was one of her goals as she started her partnership with Marley Spoon. To break the vicious circle of buying more than we can chew, we have to change our eating habits. And that’s exactly where meal kit delivery services come in handy since they ship you only the products you need and the ingredients you are really going to use this week. In fact, the best meal delivery service is the one that cares about three things the most: your health, your time and your wallet. And when we say “your wallet”, we mean helping you keep it full instead of devouring it. 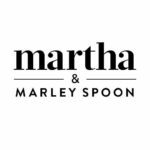 How does the Martha & Marley Spoon service work? Well, first you have to create an account on their website. Then, you’ll get access to the weekly menu and you’ll be able to choose any of the seven delicious dinners Martha and the team of her chefs created for you. After you decide what you’d like to try, think about the number of people you need to feed and of the number of nights you want to cook. You can order a smaller box for 2 adults or a family box for 2 adults and 2 children. The minimum order is 4 portions (with each recipe made in two portions). Of course, your subscription will be flexible, which means you can skip weeks whenever you don’t want a delivery. By the way, shipping is free of charge: you only pay for the products. After you’ve placed an order, a neatly packed box with the freshest ingredients arrives to your doorstep. And that’s where the fun – that is, the cooking begins! Inside your box, you’re going to find recipe cards with detailed explanations on how to prepare your masterpiece. Now, you can recall the times you saw Martha Stewart on TV shows and imagine you’re one of the chefs trying to gain her approval. However, don’t worry too much since the recipes have been tested multiple times to ensure that the result does not disappoint you even if you’re not that good at cooking. Once you order from Martha & Marley Spoon, which aims to become the best meal delivery service in the US, what do you get apart from the food? Well, first of all, you get the emotions. After all, it’s great to cook if you can enjoy it without pondering what to prepare and running from one supermarket to another. You get the pleasure of having family dinner with your loved ones: without haste, without wasted ingredients, without kitchen fiascos. You regain control over your family budget since you pay only for the ingredients you eat. And finally, you get more joy in your life. Isn’t that what we’re all after?